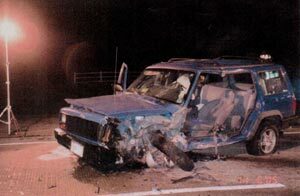 On November 06, 2005; My son Jeromy and I were on our way home from visiting relatives, and our 1997 Jeep Cherokee was hit head-on by a fifth offense drunk driver. I was driving my son's Jeep at the time because he was too tired to drive. We were hit at over 100 miles per hour on a four lane state highway in Wisconsin. He, my son had a cracked collar bone, and I was seriously injured, had surgery, was burned, shattered my left side, broke my ankle and heel, sliced my tongue off, and was on a respirator for a collapsed lung. When I got to the hospital, something was poking me in my left hip, I put my hand in my pocket, and I had forgotten I had been cleansing my stones earlier that day, I pulled out an amethyst stone that I subconsciously put in my pocket ... It was in 2 pieces now from the accident. In 2009, I kept the part with the damage done to it, and I sent the other half with my brother in his casket ... He died of cancer at 48. Inspiration for Story: Don't drink and drive.